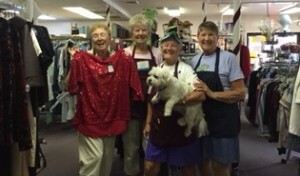 Thank you to everyone who attended, supported, and/or volunteered for Holy Paws! 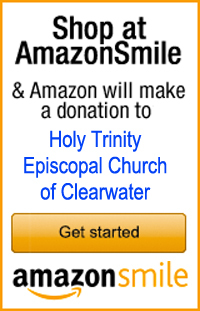 More than $17,000 was raised for Holy Trinity and The Humane Society of Pinellas. We have just a handful of exciting items still available for purchase. If interested, please call the church office, 727-796-5514, or email church@holytrinityclw.org. Call or email fast. These items will go quick. “Mabel the Elephant,” offset framed lithograph from the Bombay Company, size 28.0″ W x 44.5″ H x 1.5″ D. Previously sold for $204. This black and white illustration depicts the profile of a regal elephant. Matted and set behind glass in a contemporary wood frame with a black and silver finish. 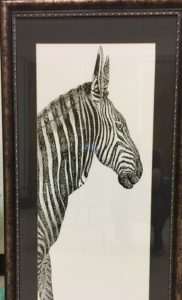 “Zoe the Zebra,” offset framed lithograph from the Bombay Company, size 28.0″ W x 44.5″ H x 1.5″ D. This lithograph is not available elsewhere and copies have been sold at auction! 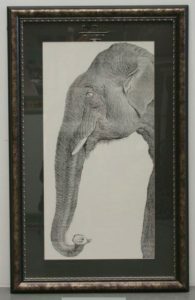 See it at https://www.ebth.com/items/1371394-mabel-the-elephant-offset-lithograph. Zoe the Zebra pairs perfectly with Mabel the Elephant. Beautiful black and silver frame. Jose Buatista, Toronto Blue Jays “The Bat Flip” framed art. Value: $190. 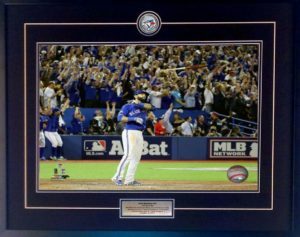 (see: http://dglsports.ca/product/jose-bautista-the-bat-flip/ ) This framed art is in mint condition! Wednesday, October 14, 2015 was one of the most exciting, memorable, unbelievable crazy games at Rogers Centre in Toronto, in the deciding game of the ALDS – Blue Jays vs the Texas Rangers. With the game tied 3-3, two on and two outs in the bottom of the 7th inning, Jose Bautista, sends a 1-1 pitch deep into left-centre and in an already super-charged emotional atmosphere, Joey Bats launches his bat down the first base line and towards the Rangers dugout. It will forever be called “The Bat Flip Heard ‘Round the World.” Image Size 18×12 – Framed size (outside measurements 28×22 – landscape format). The image is double matted in a solid back wood frame, with a descriptive sublimated plaque detailing the event and MLB licensed Blue Jays logo pin. Dental Arts tooth whitening by Larry Lieberman, DDS. Certificate. Includes whitening treatment, custom trays, and gel. Value is $250. Dental office address is located at 35691 US 19N Palm Harbor FL 34684. 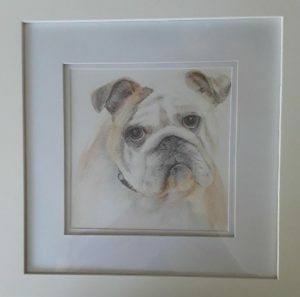 Susan-Jane Howard, original colored pencil drawing “The Bulldog” in 16” x 16” white frame with white matting. Value: $125. If you know someone with a bulldog for a pet, this might be a beautiful holiday gift! Call or email now. These items will go fast.